For four decades, David Sing has provided leadership in developing successful educational programs for Native Hawaiians and other groups at UH Hilo and throughout the 10-campus UH System. His work at UH Hilo started in the early 1980’s, when he was part of a team of educators who started the UH Hilo Hawaiian Leadership Development Program. The Nā Pua No‘eau Center for Gifted and Talented Native Hawaiian Children was created at UH Hilo for the purpose of increasing educational enrichment opportunities for Hawaiian children in kindergarten through 12th grade. Under Sing’s leadership, outreach centers were later established on the islands of Maui, Kaua‘i, O‘ahu, Molokai, Lāna‘i, and the west side of Hawai‘i Island to expand activities throughout the state. Over the course of 25 years, Nā Pua Noʻeau has provided educational enrichment to over 16,000 students from different communities throughout the state of Hawaiʻi. 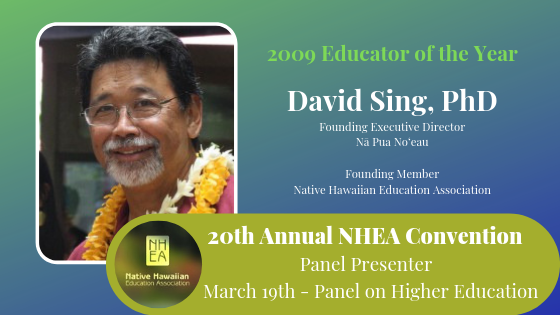 In 2009, Sing received the Native Hawaiian Education Award recognizing him as the outstanding educator of the year contributing to the achievement and educational enrichment of Native Hawaiian children. He also was awarded the 2008 National Indian Education Association Educator of the Year Award. He received his bachelor of arts in Asian studies from UH Mānoa, and his master of arts in education and doctor of philosophy in education from Claremont Graduate University, California. Gail Makuakāne-Lundin is the executive director of UH System’s Hawai‘i Papa O Ke Ao and also the executive essistant to the chancellor at UH Hilo. She has formerly served as interim VCSA from 1997 to 2000. Recently, she’s been interim executive assistant to the chancellor since 2011. Before that, she was director of Kīpuka Native Hawaiian Student Center for seven years, where she oversaw the center’s various activities and resources which provide opportunities for Native Hawaiian students to achieve academic excellence. Currently and for many years, Gail has served as executive coordinator for Student Development Programs and also as principal investigator and program director for UH Hilo’s Title III Native Hawaiian-Serving Institution Grant. 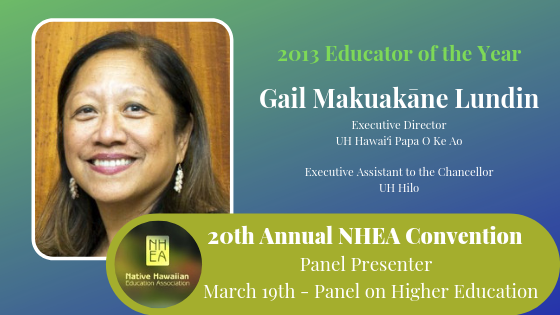 Gail also has served as coordinator of the Hawaiian Leadership Development Program and worked with Nā Pua No‘eau, the Center for Gifted and Talented Native Hawaiian Children. She assisted the John A. Burns School of Medicine in developing the Health and Community Opportunity Program, which provides opportunities for Native Hawaiian college students to enter the health field.In 2006, Gail received the UH Hilo Distinguished Service Award for Improving Student Life. Lui Hokoana was appointed University of Hawaiʻi Maui College’s chancellor on December 1, 2014. Hokoana started his higher education career at the University of Hawaiʻi in 1991 and served as the vice chancellor for student affairs at UH West Oʻahu since 2013. He also served as associate vice president for student affairs for UH System, vice chancellor of student affairs at Windward Community College and director for various programs at UH Maui College. Hokoana has secured more than $20 million in county, state, federal and private funds to support various UH systemwide initiatives that have contributed to unprecedented enrollment growth, financial aid access, service to underrepresented groups and overall student success. He was named State Manager of the Year by the State of Hawaiʻi in 2011. Hokoana earned a doctorate of education degree from the University of Southern California. He received a master’s degree in communications from UH Mānoa and bachelor’s degree in political science from UH Hilo. As vice chancellor for Student Affairs, Judy Oliveira is responsible for campus-wide planning and policy formulation and ensures that student affairs programs, services and activities are aligned with the academic mission and strategic goals of UH West O‘ahu. Oliveira provides leadership for the delivery and administration of a full-range of student affairs programs including enrollment management, admissions, outreach, academic program advising, student orientation and registration, financial aid, activities, counseling, cultural advising, health and wellness, judicial affairs, first-year experience and retention, and career development. As a member of the university’s senior staff, she is responsible for overseeing the budget and material resources of the Student Affairs department and developing a comprehensive learning environment with a successful program of student retention that complements UH West O‘ahu’s strategic plan for recruitment and enrollment. Prior to joining UH West O‘ahu, Oliveira served as the interim vice chancellor for student affairs and as TRIO educational talent search director/principal investigator at Windward Community College where she managed five U.S. Department of Education grants, totaling over $4 million dollars, to improve college access and completion for low income, first generation and Native Hawaiian students. Oliveira’s education career began at Maryknoll School where she was a teacher for seven years. 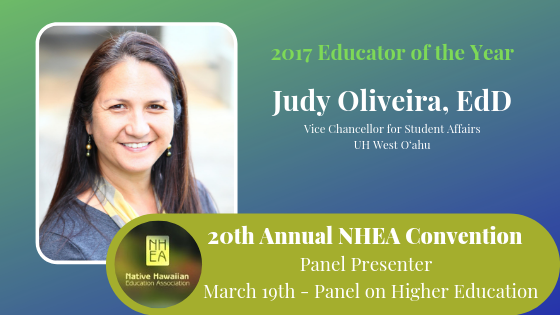 Oliveira holds a bachelor’s degree in elementary education from UH Mānoa, a master’s degree in curriculum and instruction from Gonzaga University, and a doctoral degree in educational leadership from the University of Southern California. 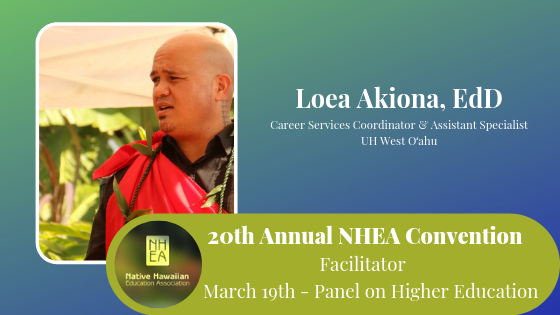 Loea Akiona is a faculty specialist and career services counselor and coordinator at UH West O‘ahu. 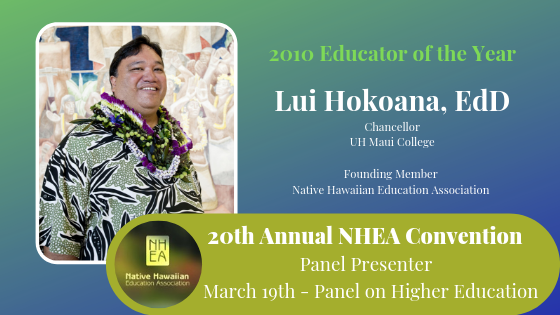 He recently earned his doctorate of education degree in professional education practice from UH Mānoa.